And just like that we are starting our second week of camp. The first week flew by. We have already finished a full week of classes, five days of exciting evening programs, one thrilling rafting trip, and had an absolute blast at our first theme day of the summer, WaterWorld. Saturday was the first trip of the summer as we travelled to Northern Maine to the Moosehead Lake Region. 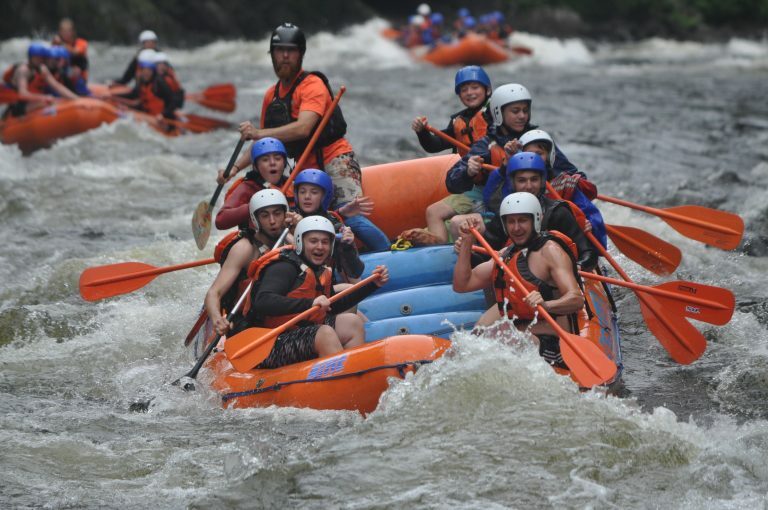 Campers had the choice of choosing a tranquil canoe trip and hike to Moxie Falls, while others opted for whitewater rafting on the Kennebec River. Both trips were filled with adventure and exhilaration and judging by the tired smiles on the bus ride home, everyone had a fun-filled day. Last night, we had one of the most special nights at camp, and that is our Opening Campfire, a favorite here at North Star. It provides an encouraging space for anyone who likes to perform. We were blown away by the number campers who sang, performed a skit or showed off a unique talent. It was truly amazing to see so much confidence and engagement, especially from our new campers. The support and encouragement from everyone was remarkable to watch and is something we are most proud of here at North Star. The campfire wasn’t complete until we capped it off with roasting marshmallows and making s’mores for evening snack. Week 1 classes were highlighted by the introduction of some very exciting new classes. Campers learned to explore the outdoors in Primitive Skills, produced our own CNSTV newscast, and created beautiful works of art in Ceramics and Fabric Arts. The week ahead brings more new and exciting options for our campers including Campfire Cooking, Magic and Acapella singing. All classes focus on teaching our campers 21st Century Life Skills – communication, creativity, collaboration and critical thinking. The camp musical is one of the few classes that extends more than one week. Campers continue to rehearse for the performance of “Matlida” on Thursday, July 20th. Our cast have been singing, dancing and acting their hearts out over the past week and we can already tell it’s going to be an amazing show! We are on a high after this incredible first week at camp and we cannot wait to do it all over again for Week Two! Be sure to stay connected to North Star on social media so you are up to date on all the exciting activities happening throughout the week ahead.